“What! ?” you gasp? This is a blog about fitness and I say leave the TV on? How can this be? Well, I get exhaustion. I get being tired of employment and dishes and laundry and packing and unpacking the never-ending bags and containers and drawers that have to be packed with a family. So leave the TV on. Distract yourself for a while with your favorite show (that the kids can watch with you). Just don’t sit down! Keep standing or lie down on the floor (not couch), where you can stretch or do Pilates. Putting out energy will give you energy, so even though you have no oomph left at the end of the day, try watching TV while marching with the highest knees you’ve ever seen. Lift your legs side to side until you can’t lift them any longer. Be sure your children are doing all of this with you. Kick your legs back behind you with straight legs, then bent, then in any manner you can think of. Try clock lunges. Then start again. Don’t just do it during commercials, move for the whole show, and you’ll be shocked how much better you fe el by the end. Tap or jump side to side, run in place, do jumping jacks, and pump your arms vigorously as you do all the above to get your heart rate up even higher. You don’t even have to move your legs if you don’t want to! Pretend you are swimming on land with just your arms. Pump your arms up and down, side to side in every direction at varied speeds, and your heart rate will go up. A lot. And your kids will be laughing as they do it too and suddenly, you’ll be a family watching TV while exercising. Dare yourself to go a week without lounging on the sofa. After that week, it just might feel “wrong” to sit on the couch. Perhaps you’ll even get to a space where you only allow yourself to turn the TV on if you are simultaneously exercising?! There is the original version of rock, scissor, paper. Then there is the active, really fun version using your body as the rock, scissor or paper. Now play as fast as you can with your child. The person who wins the most rounds out of 20 wins. Is your heart rate up? Are you laughing? Then you are playing it correctly. Play the lying down versions slowly, watching your form, moving deliberately into each position. 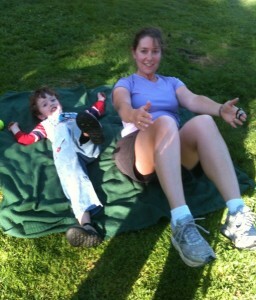 Try it face up and down for 20 rounds and realize you’ve exercised your whole body all while having fun family time! That’s a winning game! Remember the game Twister® by Hasboro? 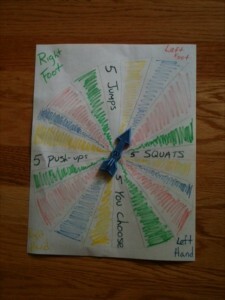 The object was to put a foot or hand on a colored circle that was called out by the person holding the spinner. Nobody realized at the time it was great for balance and isometric contractions of muscles. If you have the game, dust it off and play it together! If you don’t, create one indoors with masking tape, or outside with chalk. Put masking tape on the floor in four rows of four, pick four colors to color the tape, and you’re done. I didn’t have masking tape the day we made ours, so my 4-year-old daughter just wrote the word “red” in red marker on four squares and tap ed them to the floor. (You can see this is a fitness blog, NOT one about art!) The best part of creating your own game is you get to create a spinner and new challenges. If you are making a spinner, add in jumping jack or squat jump challenges to the mix just for fun (5 jumping jacks, then go back to holding the position you were in.) Everyone has to play the new parts you’ve added, so everyone does 5 push-ups, etc. and then everyone takes turns “spinning” per usual. When adding new activities, include a “free choice” spot, you never know what your child will do. My kids liked to run around the room, hop on one foot and jump like crazy as a “free choice”. They loved that I had to do it too. As long as children know their colors, they can play. Once they know their right from their left, add that into the game. Invite teenagers to play with a blind fold on (they will love it! ), grandparents to play along (they’ll know the game and reminisce) and kids of different ages to play since they’ll be good at different aspects of the game. Since my kids are so small, we moved the colors closer so they could reach them all. They were able to play the game, but it actually made it harder for me, which they found hilarious. Don’t be surprised if you feel new muscles the next day! Also, be ready to make more spinner boards with different variations as your kids get older, more creative and understand how to play. There are almost an infinite number of ways to get exercise on the playground. You could go to the playground every day of the year and never repeat an exercise. How? Think about just the swings alone. You can run around the outside of them, making a huge circle to dodge the arc of the swings. If they aren’t being used, you can use them as if they were cones, weaving around them sideways, frontwards and backwards, and underneath like a limbo bar, crouch under and don’t touch! Put both feet’s shoelaces on the swing while your hands are planted on the ground and do moving tuck or pike crunches. Or swing your legs side to side. (You’ll meet new abs you didn’t know you had!) Keep your feet up and do really hard push-ups, especially if your young child is on your back (be careful), or your tween/teen is competing with you on the next swing. Stand sideways with one foot on the swing, doing moving side lunges or squats, all while pushing your child on the next swing. If your child can swing him/herself or is old enough to lunge with you, stand with your back to the swing, one foot resting on top, and try a moving lunge, your rear foot moving back against the swing, and then upright to standing. Lie on the ground, put both feet on the swing and lift your hips to the sky. Hello hamstrings! 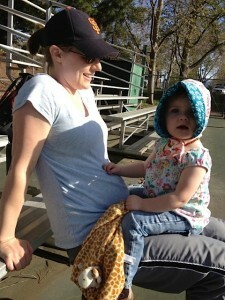 Add a young child on your hips (watch your back) and have double the fun. 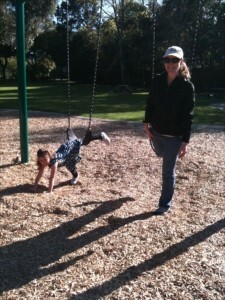 Let an older child do this on the swing next to you, they are great at this! If they want it harder, move the swing in a small arc while lifting the hips, or do it all on one leg. Hold a side plank with both feet on the swing, hand or forearm on the ground (relax your neck/throat). You’ll know what muscles you are working instantly. Kneel on the swing with one leg and try to balance, letting yourself move 360 degrees. The list of fun is truly endless. Play, and let your child create new exercises, too. You’ll be sore but happy together tomorrow!